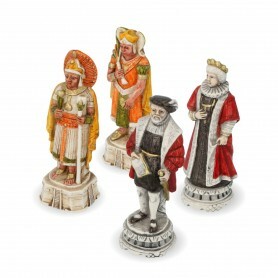 In this section you will find a wide range of chess pieces made with technologically advanced methods but following tradition and care that the master craftsmen were able to pass down until today. You can find chess pieces to learn how to play chess, chess travel sets, chess pieces in fine wood and metal, chess pieces in resin and alabaster hand painted ... and among all these items, we hope you'll find the best for you! 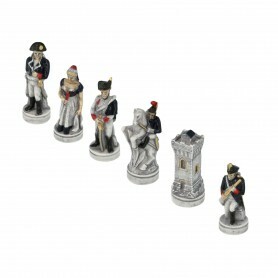 These chess pieces are made starting from the study of historical battles and epoch costumes. 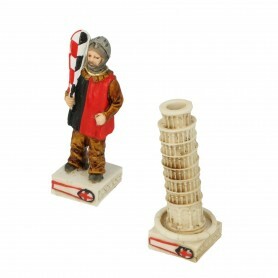 They are made of alabaster and resin, completely finished and hand-painted one by one by our master craftsmen from Tuscany. They are made with advanced technologies but with methods passed down from generation to generation, maintaining the same care and dedication of a time. The characteristics of craftsmanship allow us to obtain a piece of furniture, one unique piece, not just a chess game! In this section the chess pieces has the characteristic that all the teams of the order or of the presented game can be combined, according to the preferences of the purchaser within the same game (Maritime Republics, Order of the Crusaders, the Middlebridge game, the Palio of Siena). The price remains unchanged regardless of the selected combination. 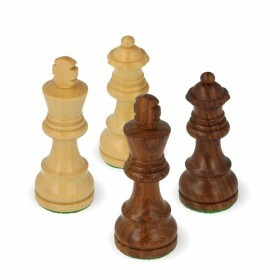 Our choice of handmade classical chess pieces, exclusively made in Tuscany. 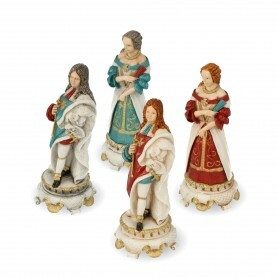 The depicted chess pieces made in this category have traditional characteristics that can be attributed to the game of chess. They are made of materials such as metal and wood, and its line, which is represented mainly by the model Staunton, is the one you imagine as classical chess. Artistic chess pieces in single teams has the characteristic of being combinable to form an original game. The price of chess refers to a single team. To play chess you have to buy two teams of the same size. 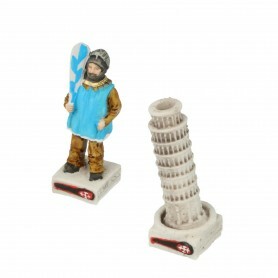 16 handmade and hand painted alabaster and resin chess pieces depicting the historic game of our city, Pisa: the Gioco del Ponte, represented with its twelve teams, called magistrature, (two of your choice). Available in this unique size. OUR EXCLUSIVE. 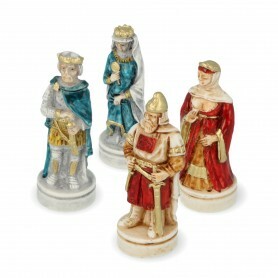 32 handmade and hand painted alabaster and resin chess pieces depicting the Battle of Spain. King Height 3,15" King Base 1,18" (King Height 8 cm King base 3 cm). 32 chess pieces in alabaster and resin handmade and hand painted representing the Battle of Actium, the Romans Vs Egyptians. Available in 4 sizes. 32 handmade and hand painted alabaster and resin chess pieces depicting the Battle of Cornwall. King Height 3,15" King Base 1,18" (King Height 8 cm King base 3 cm). 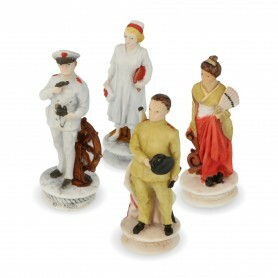 32 handcrafted and hand painted alabaster and resin chess pieces depicting the protagonists of the Battle of the Midway, Americans against Japanese of the Second World War. King Height 3,35" King Base 1,18" (King Height 8,5 cm King base 3 cm). 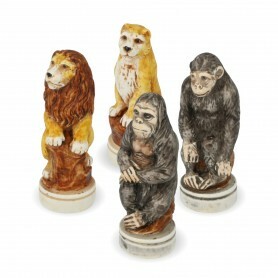 32 handcrafted and hand painted alabaster and resin chess pieces depicting the world of savannah and jungle wild animals. King Height 3,15" King Base 1,18" (King Height 8 cm King base 3 cm). 32 chess pieces in alabaster and resin handmade and hand painted representing the Battle of Waterloo. Available in 4 sizes. 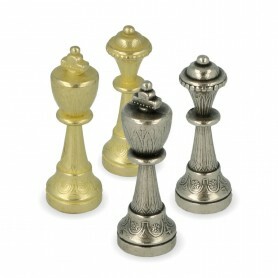 Classics Staunton chess pieces model metal zama with arabesque surface finished by hand. 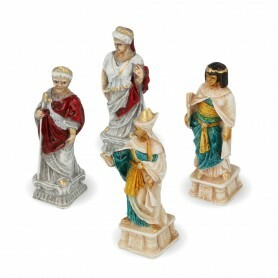 32 Classics Staunton model chess pieces zama metal with arabesqued surface finished by hand. Available in three sizes. 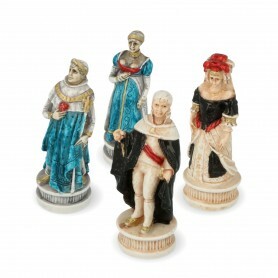 32 hand-painted and hand painted alabaster and resin chess pieces depicting the Spaniards to conquer the Inca Empire. King Height 4,53" base 1,57" (King Height 11.5 cm base 4 cm). 32 chess pieces in alabaster and resin worked and painted by hand with a brush coloring with the addition of gold and silver powder, depicting The Sun King, Louis XIV of France. Unique chess of this extra dimension, each piece is a small sculpture. King hieght 6,30” diameter 2,95” (king height 16 cm, diameter 7,5 cm).